Dexter Daily: Michael C. Hall: "Dexter Represents Sort of the Full-Flowering of the Anti-hero Trend"
Michael C. Hall: "Dexter Represents Sort of the Full-Flowering of the Anti-hero Trend"
via USA Today: A couple decades ago, when Michael C. Hall lived in the neighborhood as an NYU grad student, Tompkins Square Park was a prime place for Dexter's Miami metro, where junkies and homeless people vied for asphalt and the greenest thing around was the drug money exchanging hands. Today, on a sunny, late-summer morning, flowers are blooming amid a soundtrack of chirping birds and jungle-gym-climbing kids. Toddlers are squatting among stacks of Legos. Old folks are shading themselves under an old oak tree. "It's like an outdoor mall," says Hall, 42, who nonetheless deems the changes "nice." Once upon a time, there were certain blocks of Alphabet City that were to be avoided, Hall says in a baritone that's immediately, eerily familiar. He's swapped Dexter's sherbet South Florida shirts for downtown Manhattan charcoal suiting. "But I actually enjoyed the sense of adrenaline that came along with being in a place where you needed to keep your head up and act like you knew where you were going" — even if you didn't. Sounds a lot like the MO of a certain lovable serial killer, doesn't it? And if change has come to the East Village, it's also come to Dexter, which ends its eight-season run on Showtime this Sunday (9 p.m. ET/PT). As the "mind" of show — Jennifer Carpenter's Debra is the "heart," he says — Hall, a Golden Globe and Screen Actors Guild Award winner, feels "a real sense of pride in the collective body of work that we've all done." There's a sense of relief, too, as well as a sense of sadness, "saying goodbye to both the character and the family that we've come to be, cast and crew, writers and beyond." The adieu is comparable, he says, to when his other dead-body body of TV work, Six Feet Under, was permanently deep-sixed in 2005. Read the rest after the jump. "It feels like we got away with something." As Dexter performed devious acts of plastic-wrapped derring-do — as victims lost their lives and, specifically this season, with the neurosurgeon stalking the streets, their brains — the show has always required a willing suspension of disbelief, even on the most mundane of levels. Take Dexter's magical ability to solo-parent Harrison, work as a full-time blood-spatter analyst and kill psychopaths seamlessly. Just how does he do it? "It's a valid question," Hall concedes. 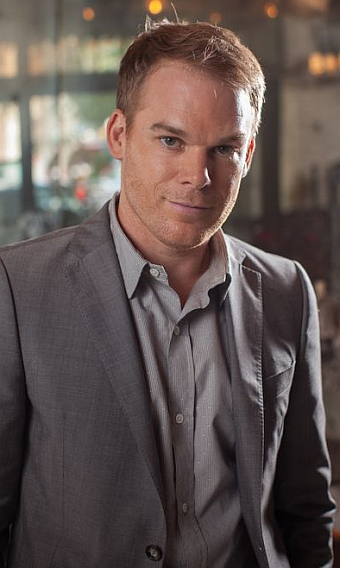 "Dexter, he definitely has found apparently a really tireless, one-of-a-kind nanny in Jamie Batista." But the fact that Hall and Carpenter have continued to make "iconic" — as Showtime president David Nevins recently put it — TV three years after they split as husband and wife is no shock. "But we were able to maintain a commitment to something that I think is a testament to our inherent connection and affection that in our case, maybe — I don't want to say goes beyond being married, but … yeah, don't try this at home." Next month, Hall cloaks himself in death yet again, this time on the big screen in Kill Your Darlings, about a real-life murder that rocked the nascent Beat brotherhood of Burroughs, Ginsburg, et al. Hall turned the kill table on himself, playing David Kammerer, the guy who gets stabbed by Kerouac comrade Lucien Carr. Add in the fact that Hall just wrapped another film, the crime thriller adaptation Cold in July, and it's easy to wonder if he has a professional death wish. "I never made it a mission statement that I'd be in one way or another surrounded by dead bodies. Or be a dead body," he says. But "I definitely have an attraction to material I guess you could describe as darker or more complex." That said, "I definitely would love to find a lighter context in which to exorcise my demons. But I do like the exorcism part of what I do."